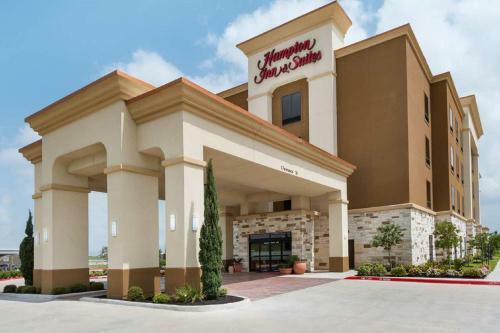 This hotel in Pasadena, Texas offers spacious rooms with free Wi-Fi and a 37-inch flat-screen TV. It features an outdoor pool and is just 10 miles from the NASA Space Center. A work desk and coffee maker are provided in all warmly decorated rooms at the Hampton Inn & Suites Houston/Pasadena. Guests can relax in the hotel’s jacuzzi or enjoy poolside seating on the sun deck. A fitness room is on site, and the business center offers a computer with free Wi-Fi. A continental breakfast is served each morning at the Pasadena Hampton Inn. This hotel is just 3.4 miles from the Pasadena Municipal Golf Course. Both the Armand Bayou Nature Center and the Hobby Airport are around a 15-minute drive from the hotel. the hotel Hampton Inn and Suites Houston Pasadena so we can give you detailed rates for the rooms in the desired period.